Acid mine drainage (AMD) is generally a non-point-source water pollutant. It is the acidic water that drains out of above-ground or under-ground coal and metal mines. Acid mine drainage impacts stream and river ecosystems by increasing acidity, depleting oxygen, and releasing heavy metals such as aluminum (Al3+), iron (Fe3+), manganese (Mn2+), and zinc (Zn2+). Acid mine drainage can occur during mining operations or long after a mine has been abandoned. 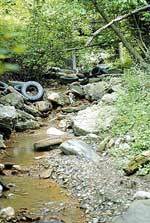 Photo: A headwater stream carrying acid mine drainage. Photo courtesy of Dr. Ben Stout. Acid mine drainage increases the acidity of a stream by introducing hydrogen ions. Acidity is commonly measured by pH values. However, pH is not always a good indicator of the presence of AMD because it only indicates the concentration of hydrogen ions in the solution. If the stream is highly buffered, it may be able to hold a large concentration of hydrogen ions without displaying a change in pH. Therefore, when evaluating a stream for AMD pollution, it is important to measure a stream's alkalinity due to dissolved carbonates in addition to measuring pH. While results of pH measurements may be inconclusive, bright orange-colored water and stained rocks are usually tell-tale signs of AMD. The orange color is caused by ferric hydroxide (Fe(OH)3 ) or "yellow-boy" precipitating out of the water as the AMD is neutralized. (See "AMD Chemistry" and "AMD Remediation" for more details.) Depending on the conditions, yellow-boy may form inside the mine or several miles downstream. Yellow-boy can harm aquatic life by increasing turbidity. The suspended solids in AMD reduce the amount of light that can penetrate the water. This affects photosynthesis by aquatic plants and visibility for aquatic animals. Furthermore, when the yellow-boy settles, it blankets the stream bed and smothers the bottom-dwellers and their food resources. Water hardness and conductivity are also useful indicators of upstream mining activity. Ferrous iron (Fe2+) from acid-generating reactions and calcium (Ca2+) from acid-neutralizing reactions may contribute to higher than average levels of water hardness in watersheds with active or abandoned mines. Leftover ions from acid-generating and acid-neutralizing reactions can also effectively increase the salt concentration, or salinity, of the water. The greater the salt concentration, the greater the conductivity of the water.